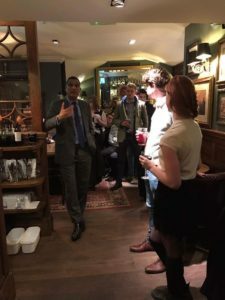 On Friday 18th November, I was invited to talk about Brexit in Westminster with students from the London Universities Conservative (LUC) group. I delivered a talk about Brexit and other issues which affect not only students but everyone in the country. There was a great turn out, full of engaging people ready to discuss the future of the UK. After my talk, I was able to engage directly with many of them on a personal level, sitting down and having a conversation, discussing their questions face to face. The points raised ranged from my views on the strategy taken for Brexit to whether or not all views from the Leave camp would be alleviated. I have always been very clear on my opinion. I am a huge supporter of Theresa May’s approach and respected the way she worked when she was the Foreign Secretary working in Brussels. She will trigger Article 50 when she knows she is ready and we as a country are ready. Brexit is an exciting time for us as a country and it will open many doors for us once again so that we can become a global leader in our own right. You can watch the video of the evening below.